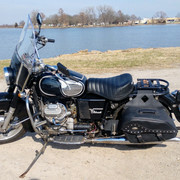 Perfect weather, today, so I got the old girl out for a nice long ride. Spent about 4 hours running around town and the back roads between my small town and the surrounding ones. She ran like a champ, as always. Although, I did notice when I got home that I have a small oil drip coming from the bottom of the left head, where it mates to the engine block. Hoping that it will seal up, when I retorque the heads, in the near future. First time out for me this spring as well. 50 degrees and some rain yesterday to wash away the salt and sand. Did 60 miles on the griso and got a savage stiff neck. Guess you gotta pay to play . 70 degrees must have felt real nice. Love your Eldo! Right on! Thanks. I'd had her out a couple of times in cooler weather over the last few weeks, but this was the first day that was nice enough to make me want to ride a good amount. Today was definitely a great day to ride... 70 degrees and sunny here in Northern Virginia. Left my house down by Mount Vernon skirted the Potomac River up through great falls and then cut over to Harpers ferry and wandered around the back roads there. 150 miles on the Griso perfect day for riding. lots of bikes out on the road today of course all styles of Harley and ADV bikes, but I did see a cafe styled/modified V7 with a bright green tank. First time I've passed a Guzzi on the road recently. Oh, I won't! She's currently my only bike, so when the weather is good, she's my daily rider! Whether it's to work and home, up to the store for a few things provisions, or just out to enjoy the weather, I'm riding, when it's nice out.